When I first thought of writing about honey bee vision, the painted hive fronts of Slovenia seemed a good place to start. These elaborate panels of folk art and lore grace the fronts of hives which are stacked tall and wide on the south facing side of traditional Alpine bee houses. The elaborate houses are fully enclosed by walls on the other three sides, but the hives constitute the fourth wall, with all the entrances facing the same way. In the early days, Slovenian hives were simply long shallow boxes, not very wide, but all stackable, both in the bee houses and on horse drawn wagons which were used to transport them from winter to summer pasturage. As modern beekeepers, we can see how the bees might be confused by being placed so close together, since honey bees are prone to “drifting,” or wandering into the neighbor’s place. Beekeepers today often paint their hives different colors to try to distinguish one from another. But what do the bees make of all of this? Certainly they don’t distinguish between a scene of a beekeeper chasing a bear versus a woman sharpening her tongue on a grinding wheel. But maybe they see shapes, colors, and patterns. Sometimes traditional wisdom is based upon experience – learning by doing. So imagine my surprise when I learned the real reason the hives are painted so fancifully. In Central Europe, during the 1700s and 1800s, people began to acquire wealth and wanted a simple and obvious way to display it. They began to decorate their furniture, possessions and even the fronts of their houses. Beekeeping was well developed and prosperous in Slovenia, and a large, well stocked bee house was a sure sign of prosperity (Beehive 1983). Hence, the tradition of painting hive fronts is a bit of ostentation on the part of the beekeepers, and perhaps means nothing at all to the bees. It wasn’t to help bees “recognize” their hives, but that folks should “recognize” their owners! While the tradition of decorated hive fronts waned during the 20th century, the habit of painting hive fronts distinct colors has not. A typical bee house will display hives colored yellow, blue, red, white, green – even lavender and so forth. But do bees really distinguish these colors at all? What do honey bees see? The Eyesight of bees, notwithstanding the wonderful mechanism of their eyes, seems less perfect than their other senses: on some occasions it scarcely serves them to distinguish the entrance of their hives, when they come home loaded with provision. Wildman thought they saw better when flying than when on foot. I believe, however, that this opinion of Wildman, will not, upon examination, be found quite correct. The mere act of flying does not enable them to see objects better (Bevan 1827). Bevan sensed that the visual acuity of honey bees is significantly less than ours, but he was wrong about the benefit of flight. Since the bees are moving, they are made capable of judging distances, which is so much more difficult from a stationary position. If we follow the little laborer during its excursions in the fields, in search for honey, we see it proceed from flower to flower with as much precision, as though this organ existed in its utmost perfection. And when it has gathered its little load, it rises in the air, and as true as the needle to the pole, it makes its way straight homewards, as if in full view of the hive. But let the hive be moved only a few inches to the right or left, or let the entrance be partially closed or turned around only one inch or two, from the place it formerly occupied, the bee appears not to notice this in the least, but flies with unerring precision to that point on the alighting board, formerly occupied by the door of the hive, and after several fruitless attempts to find the entrance, it rises again into the air, as it would appear, for the purpose of removing at such distance from the hive as is best suited to the focus of its visual organ (Phelps 1858). These writers had little to help them other than their powers of reasoning, to imagine what the bee’s eye view of the world might be. 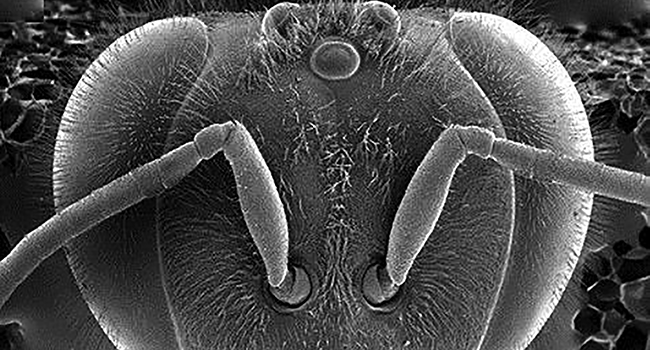 Upon the discovery of the microscope, investigators found the compound eyes of insects to be radically different from the eyes of animals and humans. Our eye has a single lens, and can be focused by the eye muscles. The lens projects the image onto the retina, where it is converted to nervous impulses. In the insect, we find thousands of tiny lenses. It is evident, therefore, that no composite eye of practicable dimension, acting as supposed above, could be made to give definition even approaching that of the human eye. The eyes would give a picture about as good as if executed in rather coarse wool-work and viewed at a distance of a foot; and, although a distant landscape could only be indifferently represented on such a coarse-grained structure, it would do very well for things near enough to occupy a considerable part of the field of view (Mallock, 1894). This view was particularly insightful but not completely accurate. In subsequent decades discoveries showed that honey bees have excellent tools for navigation at a distance, and lack of visual acuity is not really an impairment to this. I have at hand an exceptional book published in 1953 by C. R. Ribbands, a researcher at Rothamsted Experimental Station. It covers the range of bee behavior; I quote this excerpt from Chapter Two, on Vision. The honey bee is usually considered to be short-sighted, but this is a misinterpretation. The insect eye possesses no focusing mechanism; short-sightedness is a derangement of focusing ability, which can only occur in eyes with focusing arrangements, so the honeybee is not short-sighted in the sense in which we use the term among ourselves. Its indistinct vision, due to lack of acuteness, applies at all ranges. The definition of an object falls off as the distance between object and eye increases, just as it does in the human eye. At about the same time, Karl von Frisch issued his monumental work Bees: Their Vision, Chemical Senses, and Language, published in 1950. The first chapter covers “The Color Sense of Bees,” to which I already alluded. Von Frisch points out that flowers with bright colors tend to attract pollinators, so this is a clue as to what these insects are able to see (of course, there are many other attractions, including scents, and nectar rewards, but I deal here with sight). The color sense of bees had been investigated by John Lubbock, an English scientist working in the second half of the 19th century. He used the technique of placing honey on colored paper, and showed that bees associate color with reward. Through extensive experimentation, he concluded the bees’ favorite color was blue (Lubbock 1882). Training bees to come to food on orange, yellow, green, violet, or purple cardboard gives a positive result. However, if we try to train bees to find their food on scarlet red, they alight not only on the red cardboard but also on black and on all the dark-gray cards in our arrangement. Thus red and black are the same to the eye of the bee; in other words, bees are red-blind. Von Frisch mentions that scarlet red flowers are rarely found in Europe, while they are far more common in Africa and the Americas. However, these larger flowers are generally visited by birds, which are highly attracted by bright reds. Further experiments led to the discovery that while honey bees do not perceive red, they can see ultra-violet light. Their vision is shifted on the spectrum. This accounts for why bees are attracted to poppies, which appear bright red to us. They reflect brightly the ultra-violet rays and that is what the bees see. Also, the poppy is a good source of pollen. 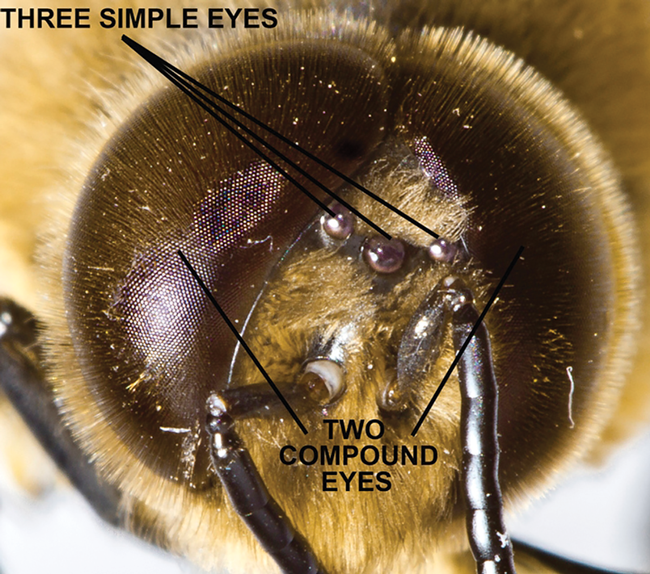 One of the foremost researchers in the field, Mandyam Srinivasan, plainly states: “The worker honey bee, by virtue of its lifestyle, is a spectacularly suitable organism for studying fundamental principles of color vision, pattern recognition, learning and memory, flight control, and navigation” (Srinivasan 1998). So then, how do bees travel many miles from home to specific locations, and how do they get back? Essential to the answer is an understanding of polarized light. The light from the sun radiates in all directions, but as it passes through our atmosphere it takes on a direction which is called polarity. While it was first described in 1871, it wasn’t until 1950 that a full analysis was presented. The observed polarity of light is the result of the position of the sun in the sky, the position of the observer, and the direction of observation. Polarity reflects where the sun is and my direction compared to it. If it’s afternoon and the sun is on my left, I am headed north (in the northern hemisphere). The distance is indicated in a rather exact manner by the number of turns in the wagging dance that are made in a given time. At 100 meters there were 9 to 10 complete cycles of the dance within 15 seconds; at 200 meters there were 7; at 1 kilometer, 4; and at 6 kilometers, only 2. If we know this relation between rate of turning and distance to the food, we can tell by means of a stop watch about how far a dancing bee has flown (von Frisch 1950). Pretty amazing that the bees show greater distance by dancing more slowly; the dance speed is the inverse of the distance. But that leads us to the most interesting question, how do they tell how far they went? Early on, researchers proposed that bees equate distance with energy expended, — like how far you can go on a tank of gas. But given factors like wind and hills, fuel consumption is seldom constant. This inquiry led to a series of experiments, carried out in the 1980s, by Mandyam Srinivasan. The researchers supposed that flying bees receive information on either side of them, as they flew through a landscape, and judge distance based on the rate which they pass landmarks. In the experiment, they trained bees to fly through a short tunnel with vertical black and white stripes on either side of them. The top was clear, enabling the investigators to observe and film the bees flying through the tunnel. Groups of four – six freely flying honey bees (Apis mellifera) were marked and trained to receive a food reward at an apparatus which offered sugar solution at the end of a tunnel formed by two walls 40 cm long, 20 cm high, and 12 cm apart. Each wall carried a pattern consisting of a vertical black and white grating with a spatial period of 3.5 cm (Kirchner 1989). 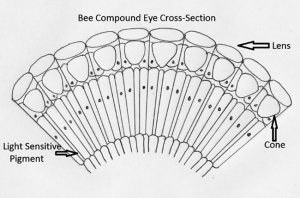 When the grating was moved at a constant speed in the direction of the bees’ flight – thereby reducing the velocity of retinal image motion on that eye relative to the other eye – the bees’ trajectories shifted toward the side of the moving grating. They were fooled into misjudging the distance; it was perceived as further away than it actually was. This work was groundbreaking at the time, but it has since been investigated much more deeply. Not only that, but the discoveries made relating to insects were quickly applied to the field of robotics. Srinivasan, et al., published Robot navigation inspired by principles of insect vision in 1998, followed in 2009 by Flying Insects and Robots. The honey bee is often given as an example of elaborate behavior, skill and ability that is present upon birth. They instinctively “know” how to do a range of things, from comb building and house keeping, to caring for the developing larvae that result from the queen’s egg laying activity. On the other hand, they need to learn a lot, very quickly. Beekeepers for centuries have observed honey bees embarking on their first “play flights.” This activity often occurs on pleasant afternoons, when larger numbers of young bees undertake orientation. Certainly, they are forming a memory of the appearance of the hive as they sally to and fro, but more importantly, they are establishing its location related to the environment. Where is the sun at that time of day? Later, they may fly toward it (direction) for a specified amount of time (distance) and will be able to return, using the information they gathered going forth. Landmark-based goal navigation in honey bees is explained as an emergent property of basic visuomotor reflexes, which are modified by a continuous learning process. Relatively unstructured, search-like flights are observed in bees with limited experience with the landmark setting. Control strategies based on a flexible and adaptable employment of basic control loops may also be suited for MAVs [autonomous micro-air vehicles] with limited storage and processing capacity to enable successful landmark navigation (Floreano 2009). Many years have passed since Thomas Nagel’s 1974 article “What Is It Like to Be a Bat?” in which he used the example of the bat’s primary system of navigation, echo location, to show how we could never really know what it is “like to be a bat.” This inspired a revolution in the study of animal consciousness, led by people such as Donald R. Griffin. Griffin argued that Nagel used a poor example to begin with, since echo location (SONAR) has been exploited by humans so we do know what that is like. Even blind human beings are able to use sound to advantage (Griffin 2001). But beyond that, by studying how animals in general, and particularly honey bees, Griffin showed that we can understand how they process the world and how they communicate with each other. In fact, researchers Couvillon and Ratnieks, working in England, observed the honey bee dances in several colonies over the entire season and were able to generate maps of the places where they most frequently foraged. It turns out they went most often to natural preserves and far less often to organically farmed lands. They were able to generate maps, which could be used to support the continued financing of preserves, not only for bees but beneficial insects in general. As beekeepers know, a worker bee’s life is short and whatever she learns dies with her. But the overlap of workers means that some information is retained by the colony. Honey bees can live from fall to spring and retain memories of places they visited the previous season, such as water sources. In this way, the knowledge of landscape features is maintained over time. Vision and memory are crucial to the success of the honey bee colony. Beehive paintings from Slovenia: loan exhibition from the Slovenian Ethnographic Museum, Ljubljana. (1983). Horniman Museum, London. Bevan, E. (1827). The Honey Bee: Its Natural History. Physiology, and Management. London: John Van Voorst. Couvillon, M. J., Schürch, R., & Ratnieks, F. L. (2014). Dancing bees communicate a foraging preference for rural lands in high-level agri-environment schemes. Current Biology, 24(11), 1212-1215. Floreano, D., Zufferey, J. C., Srinivasan, M. V., & Ellington, C. (Eds.). (2009). Flying insects and robots. Heidelberg: Springer. Griffin, D. R. (2001). Animal Minds: Beyond Cognition to Consciousness. University of Chicago Press. Horridge, A. (2009). What does the honeybee see? And how do we know? : A critique of scientific reason. ANU E Press. Kirchner, W. H., & Srinivasan, M. V. (1989). Freely flying honeybees use image motion to estimate object distance. Naturwissenschaften, 76(6), 281-282. Lubbock J. (1882) Ants, Bees and Wasps: A Record of Observations on the Habits of the Social Hymenoptera. Keegan Paul, Trench, Trübner, & Co. Ltd., London: 442 pp. Mallock, A. (1894). I. Insect sight and the defining power of composite eyes. Proceedings of the Royal Society of London, 55(331-335), 85-90. Phelps, E. W. (1856). Phelps’ Bee-keeper’s Chart: Being a Brief Practical Treatise on the Instinct, Habits and Management of the Honey-bee, in All Its Various Branches. CM Saxton. Ribbands, C. R. (1953). The behaviour and social life of honeybees. Bee Research Association Limited. ; London. Sasaki, T., & Pratt, S. C. (2018). The Psychology of Superorganisms: Collective Decision Making by Insect Societies. Annual review of entomology, 63. Von Frisch, K. (1950). 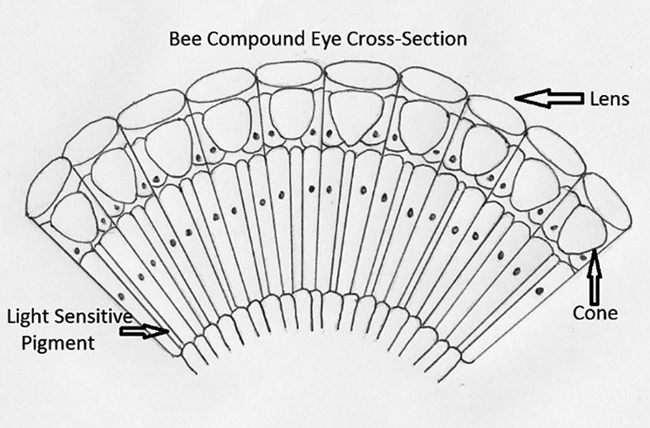 Bees: their vision, chemical senses, and language. Cornell University Press.